Immense satisfaction, joy and fulfilment can come from drawing. Even if it isn’t your artistic medium of choice, the act of regularly putting pencil to paper can enhance many aspects of your creative pursuits. And yet, many people don’t draw because self-doubt tells them they can’t. This is such a waste! It is with great pleasure that we welcome Jake Spicer to the studio for a weekend dedicated to drawing the human form. So come, be taken under the wing of one of the UK’s most accomplished drawing tutors. 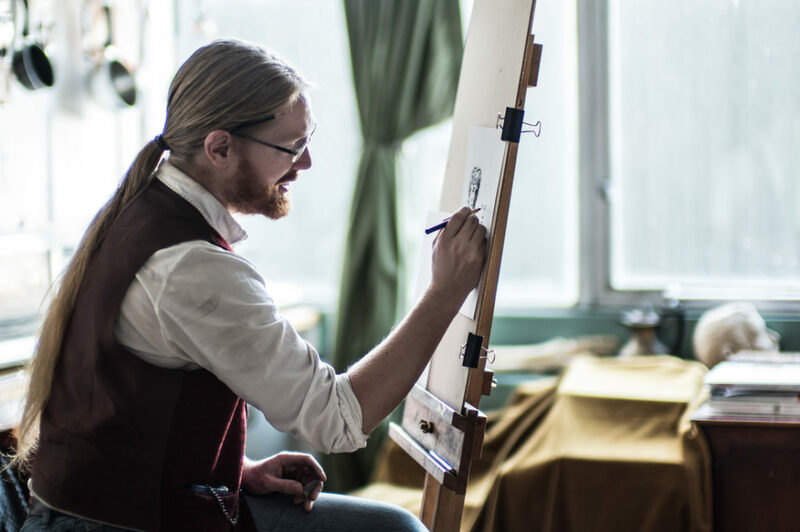 Whether you’re a complete novice or an experienced artist, we guarantee that you will not only leave feeling inspired but also with the confidence to take your newfound skills further. With an emphasis on enhancing your observational skills, Jake will guide you in capturing the human form on paper. Through studying a life model you will explore depicting contours, shapes, tones and form through a series of demonstrations and exercises, plus one-to-one tuition from Jake. As you progress through the weekend, your efforts will focus on drawing specific parts of the body, as well as getting them proportionally correct. Observational skills and capturing the form. Learning to interpret what you see in front of you, focusing on contour, shape, tone, form and gestures. Learning to get your proportions correct, tackling foreshortening and drawing faces, hands and feet. Not only is life drawing an opportunity to hone your observational drawing skills, it is an chance to respond creatively to another person. Taking time to truly look at your model and make a personal, drawn response to their presence is a profoundly engaging and creatively stimulating act. Drawing together in a life class provides us with an opportunity to share ideas, borrow approaches from one another and to appreciate the breadth of different approaches that that we all take to the subject of the human figure.